(Click PHOTO to enlarge and then hit the back arrow to return to original size). I hope your summer started off great. The weather in the northeast has been mostly sunny and a heatwave here and there, just the way I like it. How I have waited for this season to arrive since that first snowflake fell on Long Island this past winter. Being from an island and surrounded by water, you guessed it, the beach and the ocean play an important role in our summer life. Long Island is a great vacation spot. 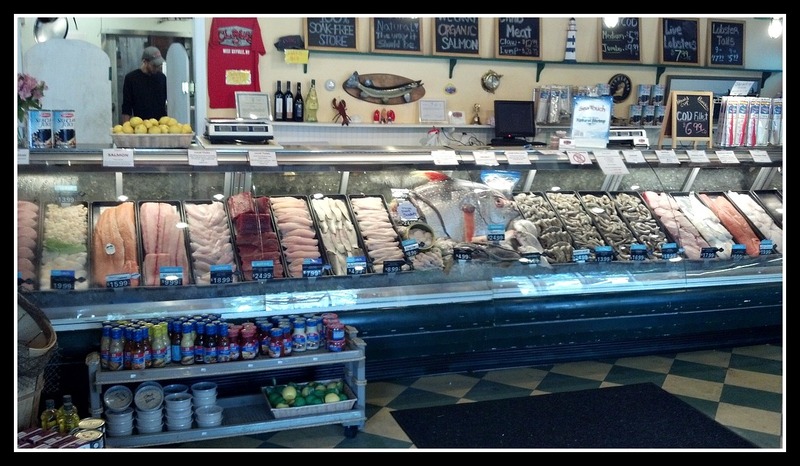 We have some of the best beaches and freshest seafood. 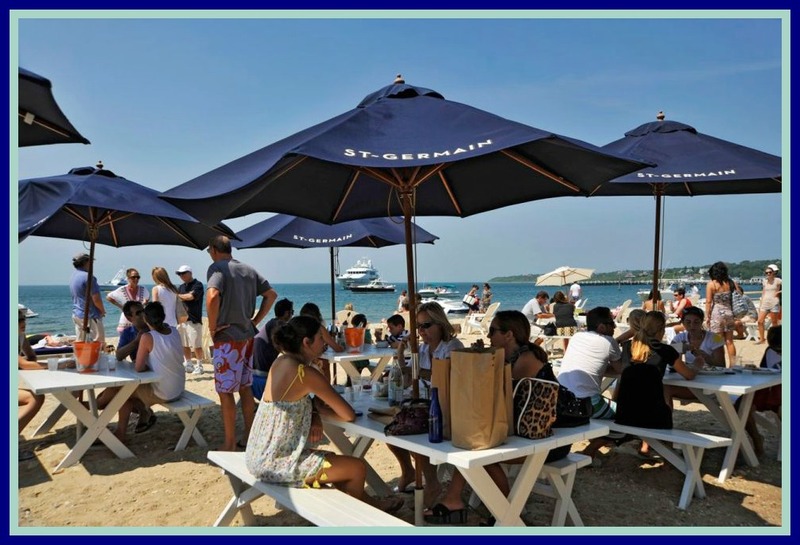 There are numerous attractions on Long Island; from beaches to wineries, museums to formal gardens and lighthouses to mansions. Too many attractions to mention here without me sounding like a travel agent or a tourist brochure. I won’t lie though, summer on LI also brings a lot of traffic with all the tourists; but once you get to your destination, it’s worth every minute you were stuck on the road. and prepare a Long Island Clambake for you. Captree Bridge- gateway to Robert Moses Beach, Jones Beach and Captree State Park. 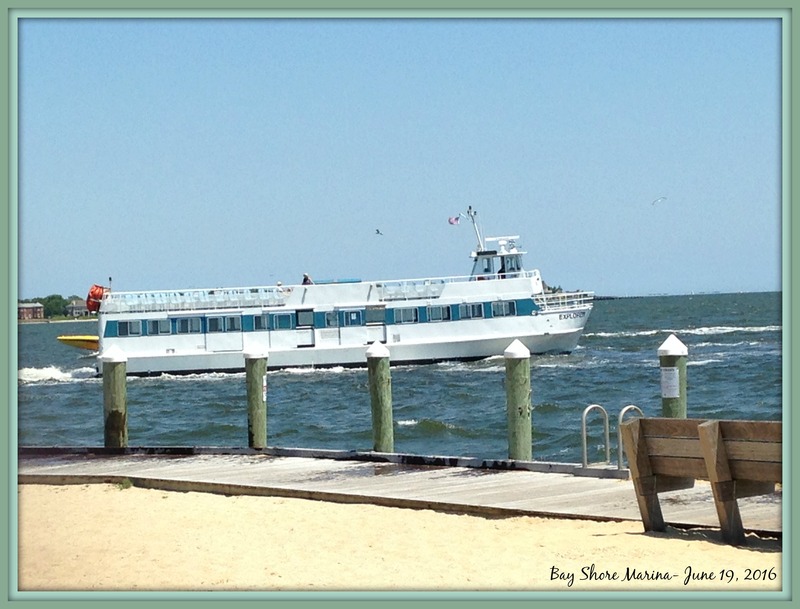 Ferry to Fire Island from the Bay Shore Marina. 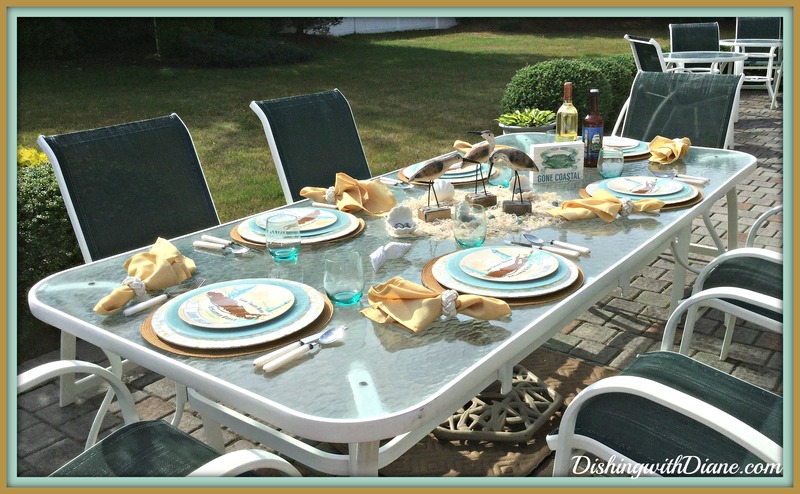 Today I would like to prepare for you a summer tablescape along with a summer seafood dinner as if you were a guest invited to my home. We are headed outdoors on a great summer day. 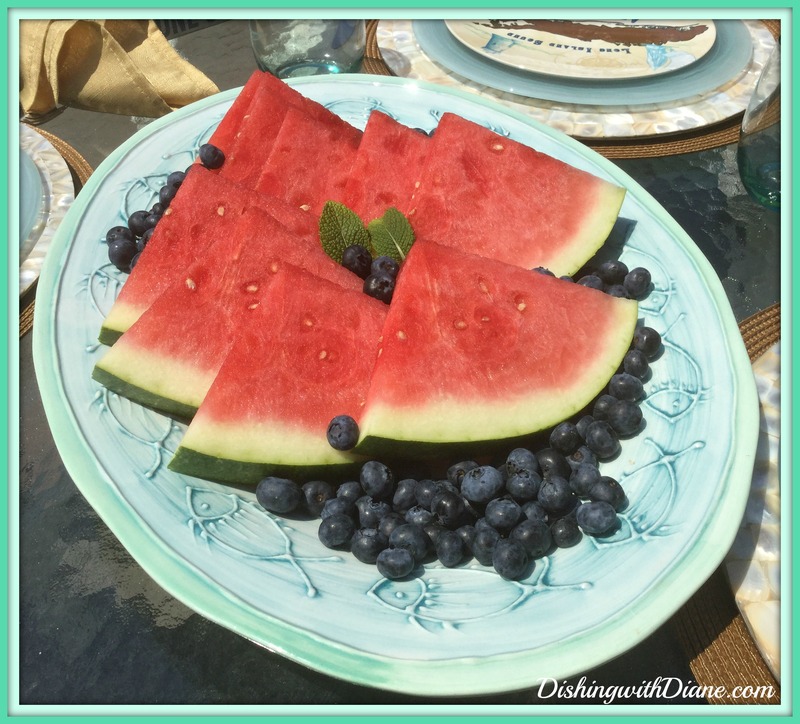 I love to entertain in the summer and outdoor dining for me means relaxing and soaking up the sun. Eating al fresco is a joy. 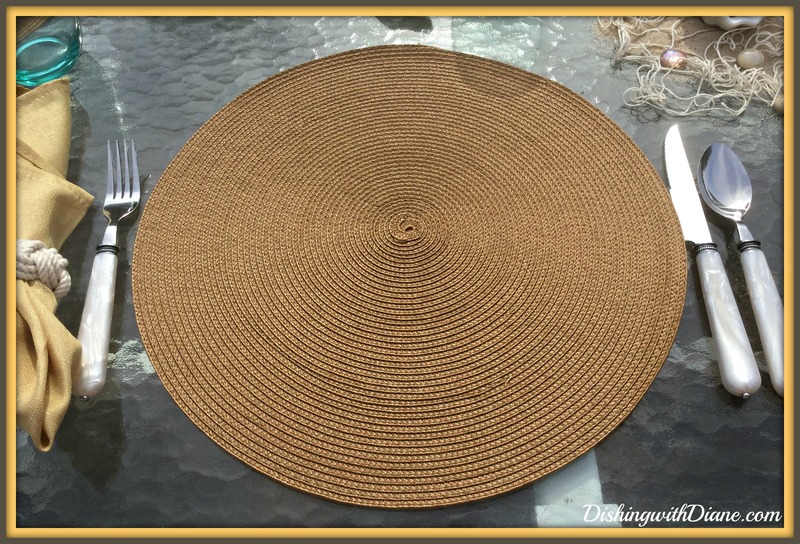 Starting off with individual woven place mats in cocoa brown. 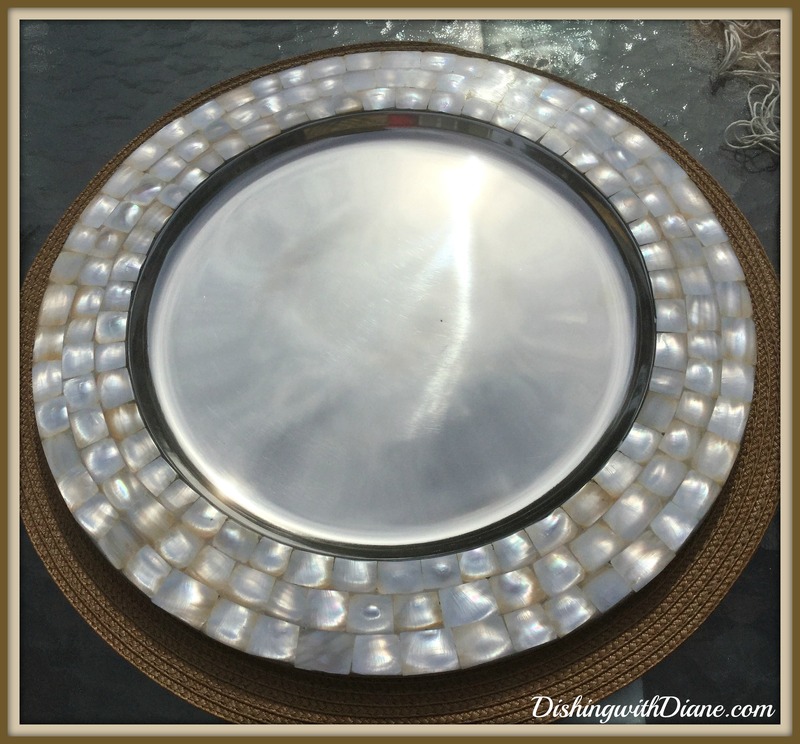 I still love a charger plate, even outdoors, so to add to the place setting I am using mother of pearl chargers. 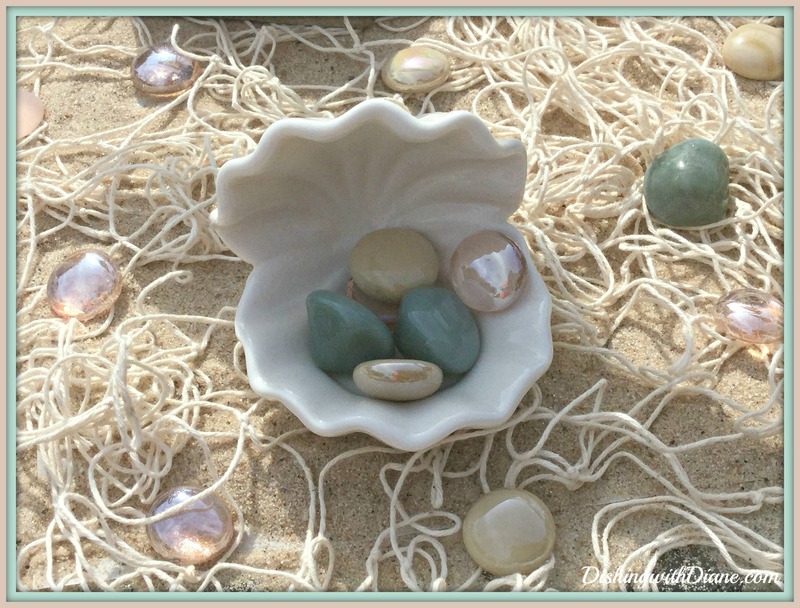 After all, mother of pearl is made from the inner lining of various mollusk shells, so they are just what we need for a seashore place setting. 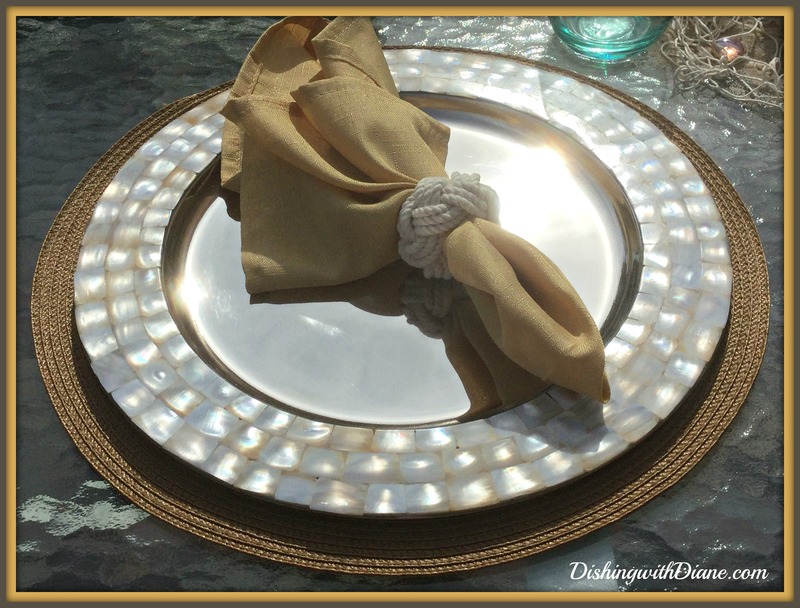 The napkins are dark tan (even though the sun makes them look like gold in the pics) and I am using a rope napkin ring in off white for that nautical feel. The main focus of this tablescape are the salad plates. I found them in Bed, Bath and Beyond last summer and I knew immediately I had to own them. They are just too cute. Since I am a Long Islander born and raised, this just made sense. 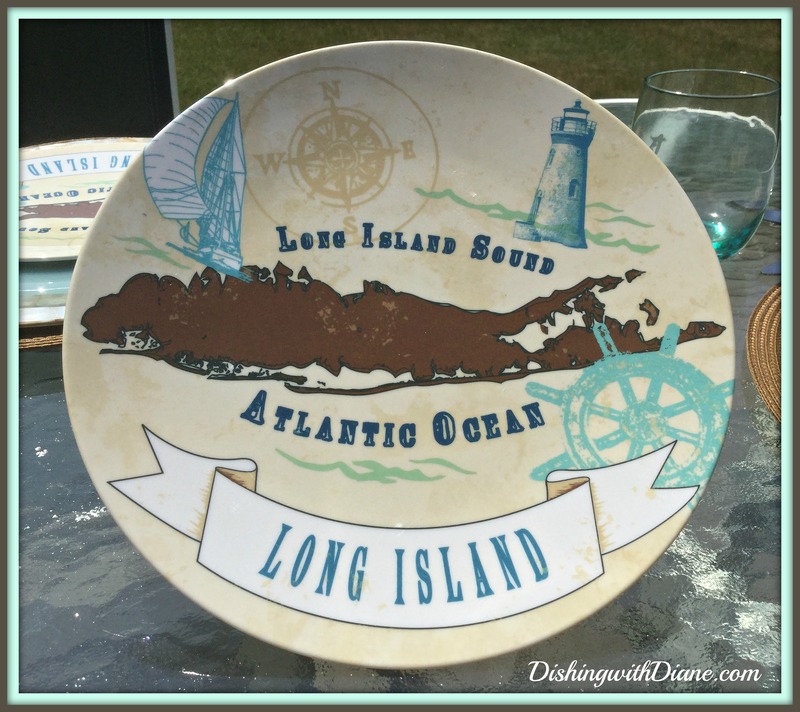 Melamine salad plates that symbolize Long Island. 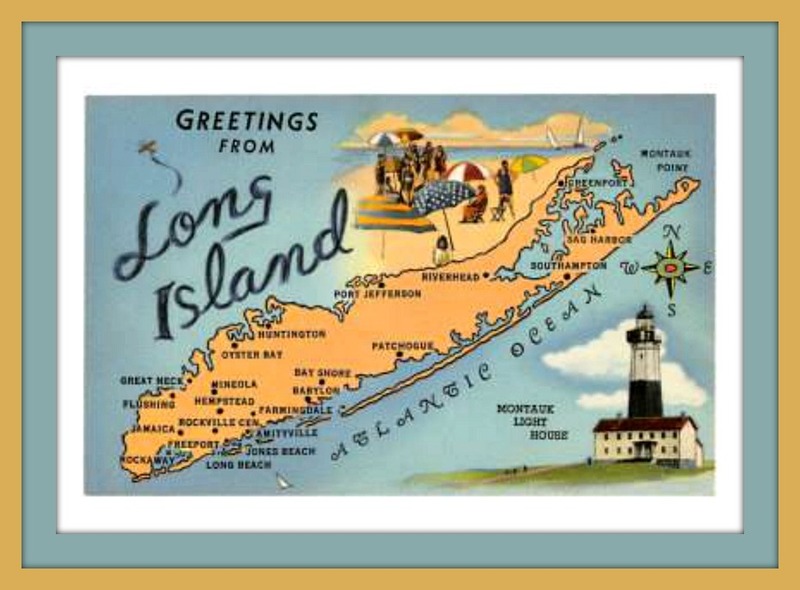 They have a beige background with the map of Long Island in brown; complete with surrounding bodies of water and nautical designs in turquoise and white to showcase our lighthouses, boating and sailing. Too cute, right? 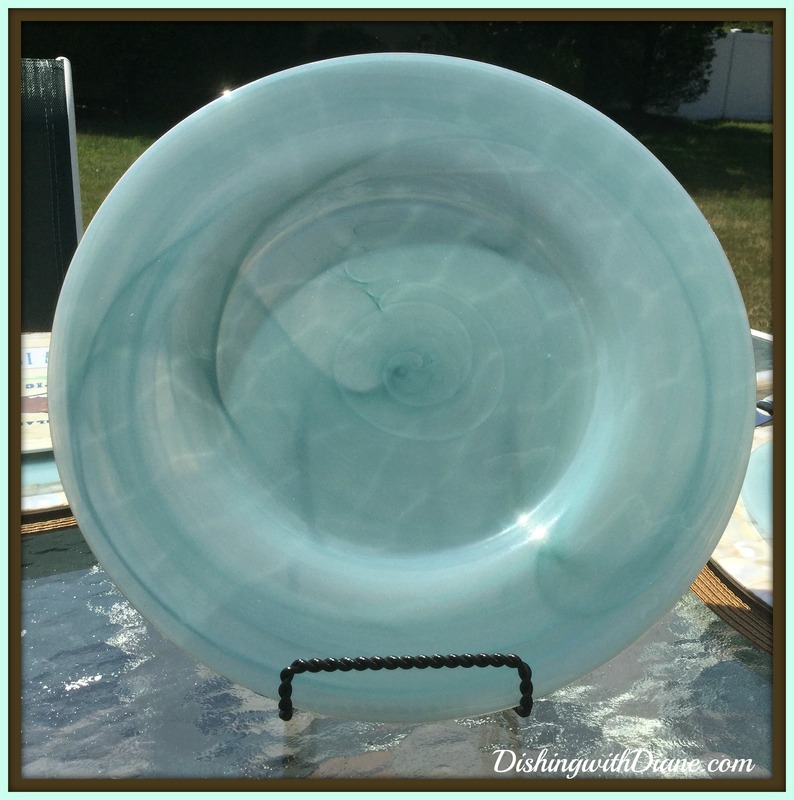 This tablescape gives me the opportunity to use another recent purchase of mine; glass dinner plates in the prettiest shade of turquoise. 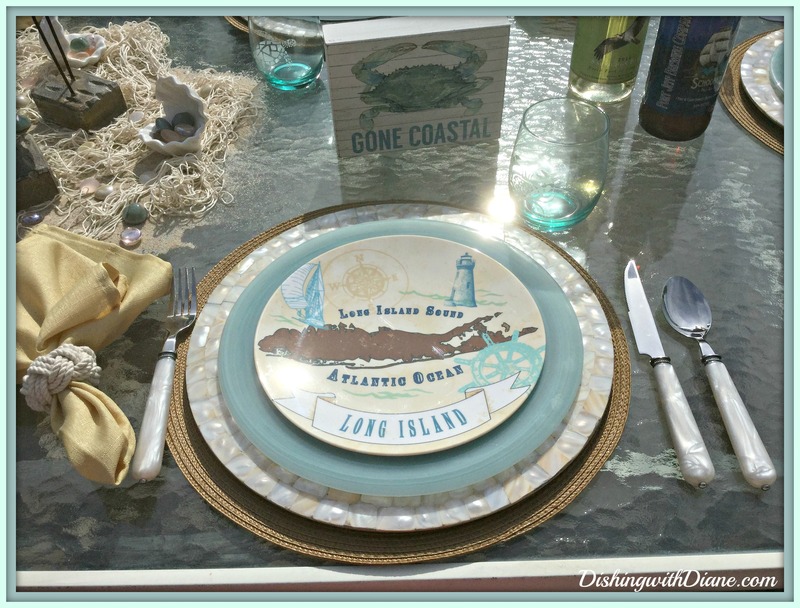 I originally bought these plates to match some nautical glassware I have; but I think they will be a nice addition to this tablescape. 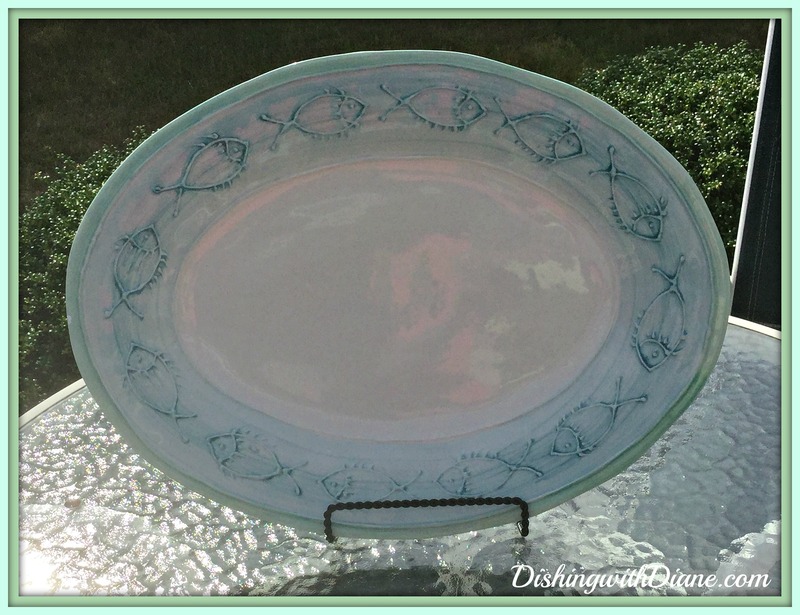 The dinner plates just remind me of the ocean; and combined with the salad plate- a match made in heaven. 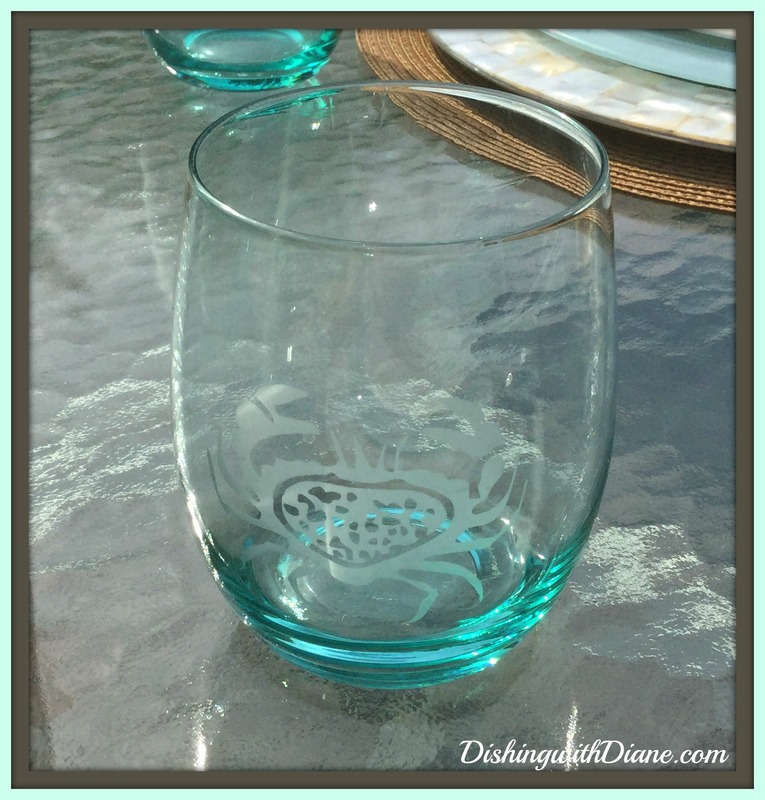 I am using stemless wine glasses with various seashore designs. The base is also a soft shade of turquoise. 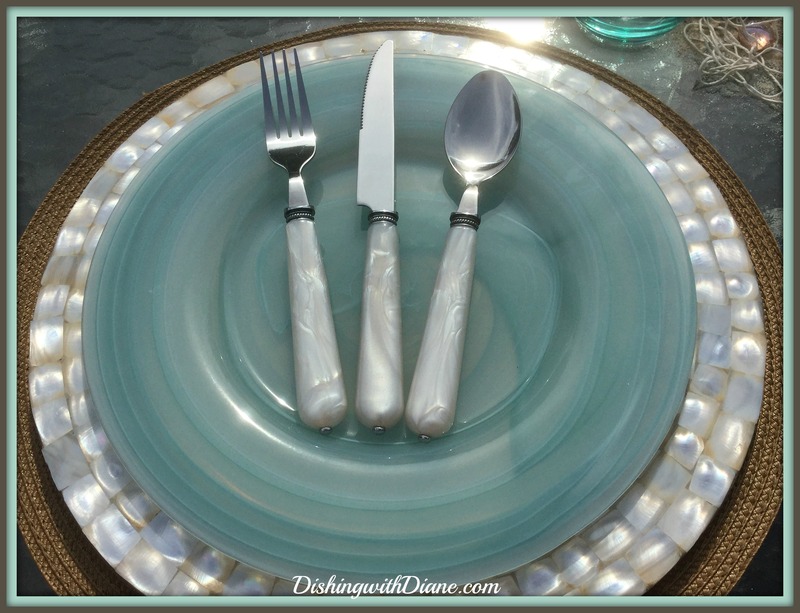 The flatware is off white pearl which matches the rim of the mother of pearl charger. 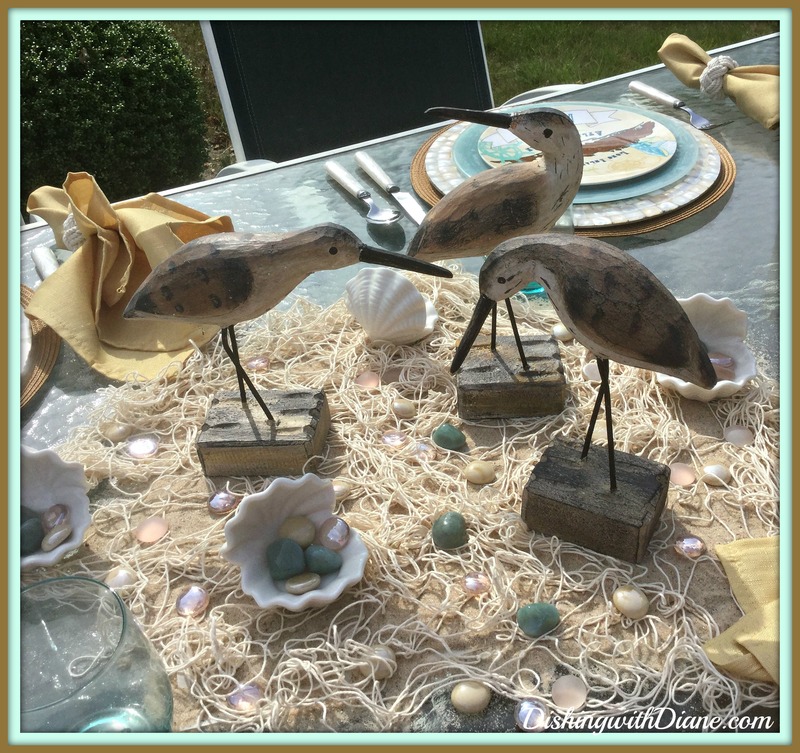 For a centerpiece, I am keeping it simple so I have enough room for the food; so I am taking out the wooden sandpipers once again. 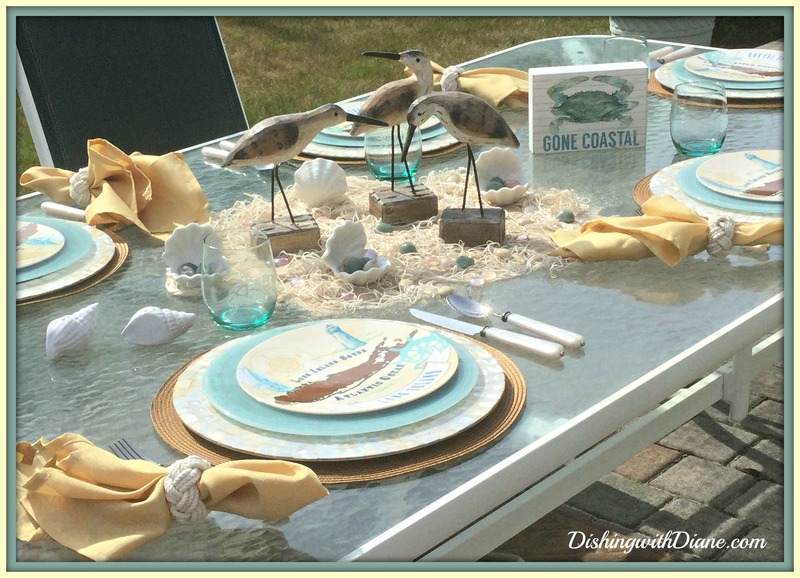 I added a little sand on the table along with some seashore accessories. One of my favorite additions to this tablescape is a recent gift, given to me from my honey, Bob. 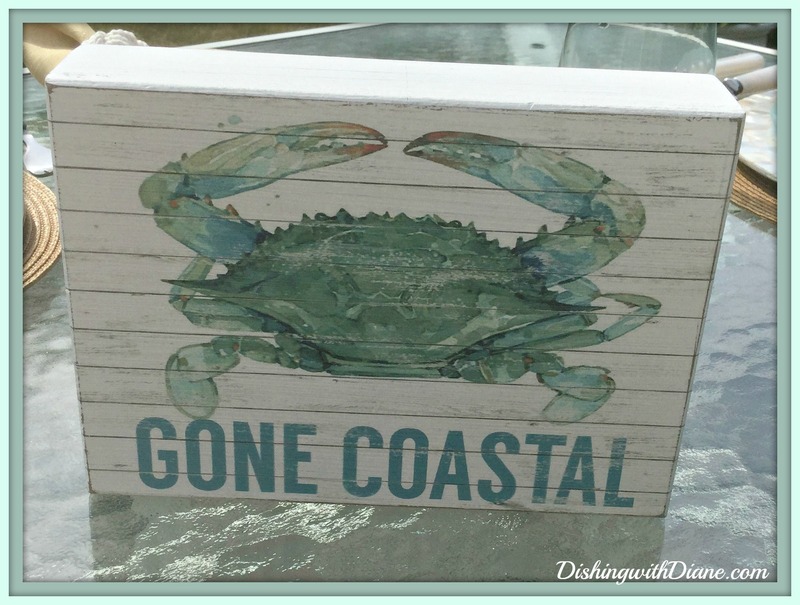 The gift is a sign that says, “Gone Coastal” – that’s me. I keep this on my desk at home. I just love it. As you can see, the painting on the sign is a crab; also a very important part of Long Island. And the bonus is that the sign is the same colors as my place setting. A few more table accents and this tablescape will be complete. Seashell salt and pepper shakers, clam shell tea lights and some scattered fish net around the centerpiece. 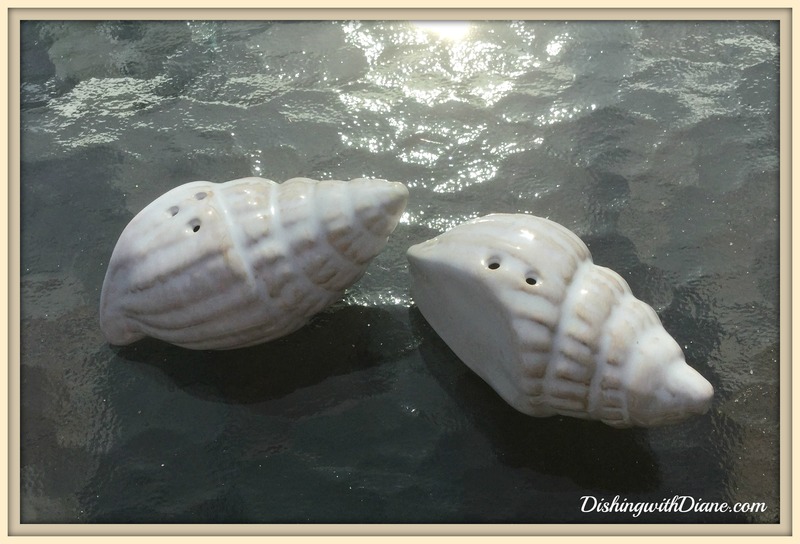 I love this picture of the salt & pepper shaker because the way the sun hits the table, it reminds me of the sun reflecting off the ocean. I filled the tea lights with turquoise & tan rocks and gems that match the colors of the salad plate instead of a candle. 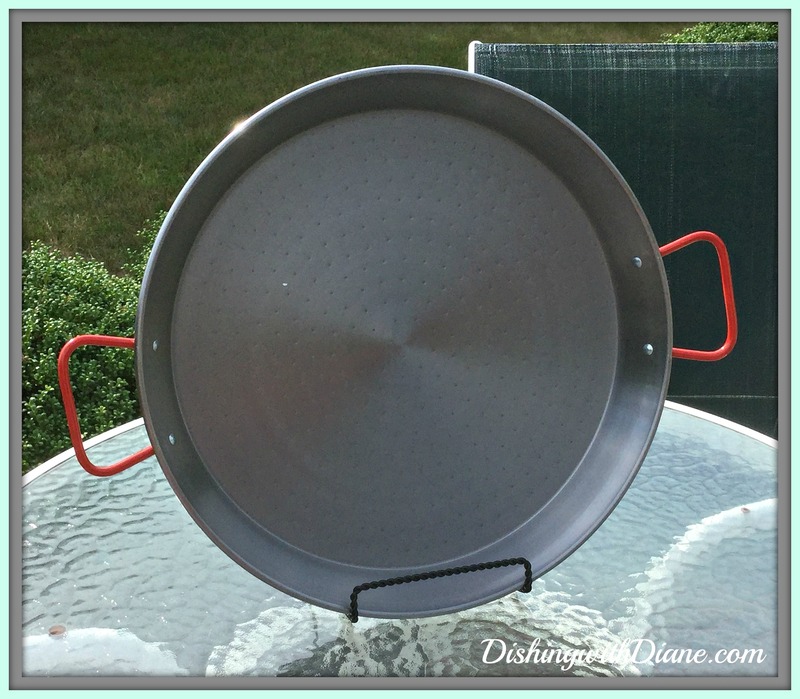 I am using a paella pan to serve the shellfish and shrimp. 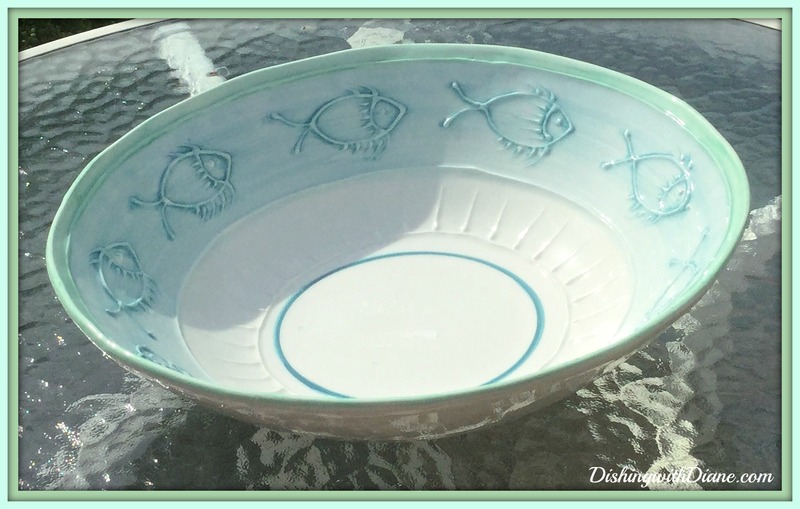 and some blue and turquoise Italian made ceramic platters and serving bowls with a fish design for the rest of the meal. The colors of the platter and bowls pick up the color of the dinner plate. Almost looks as if they were made as a set. The tablescape is now complete. 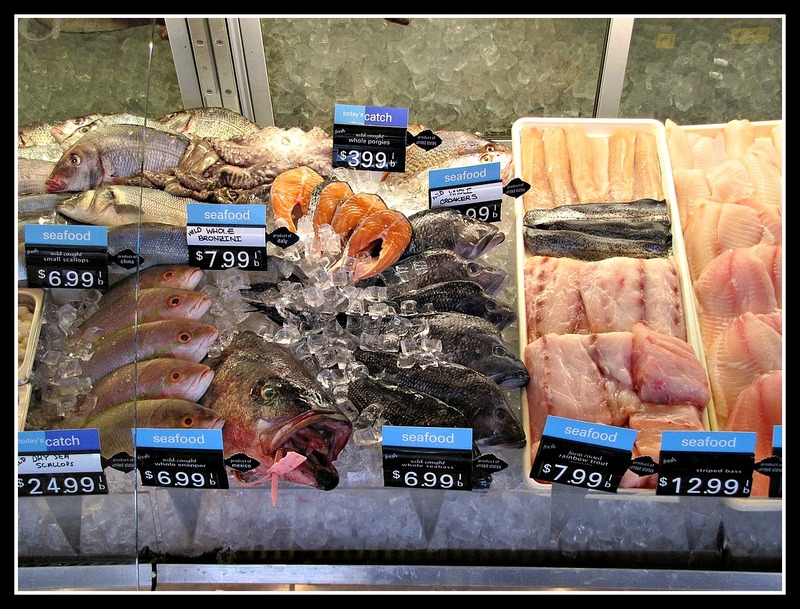 You have many options to get fish on Long Island. You can start by catching your own fish. There are so many places on Long Island to go fishing. Too many to mention. One that is close to my heart is Jones Beach Fishing Pier. 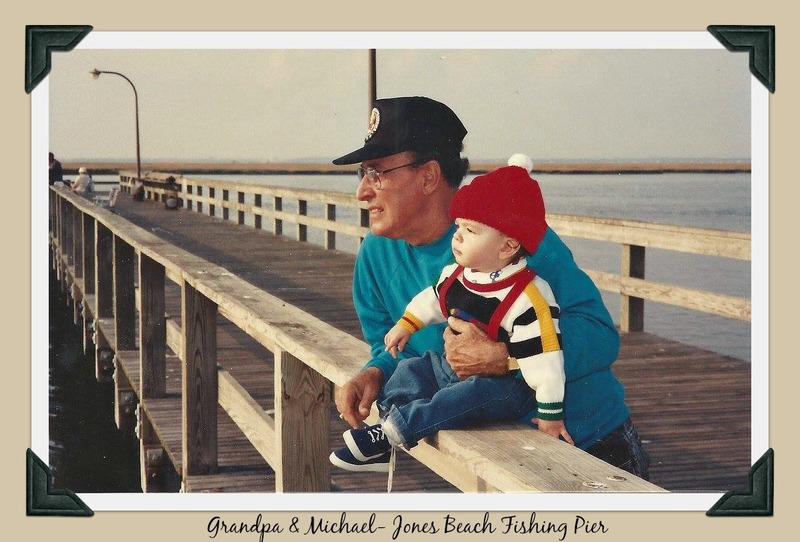 My dad went fishing every day at that pier and also brought Michael down on many occasions. I think he was getting ready to make Michael a fisherman. 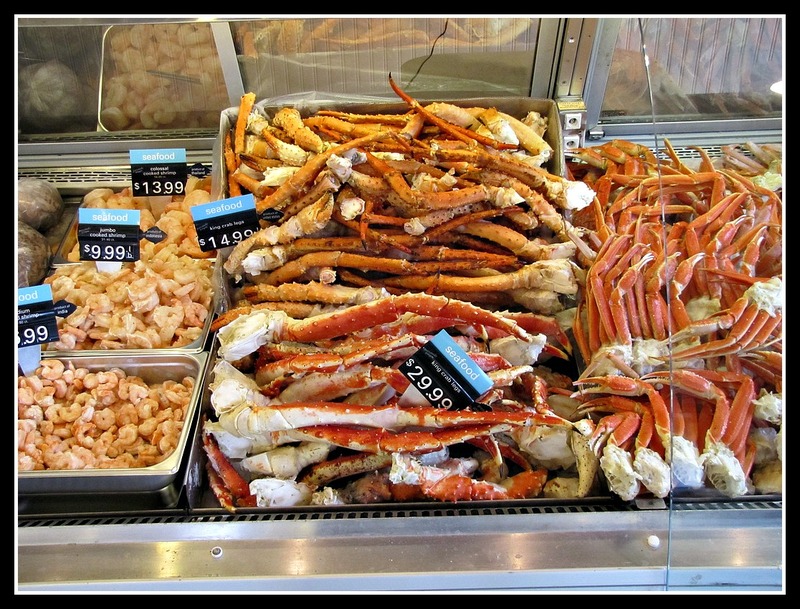 If you are not into fishing, there are many places to purchase fresh seafood. 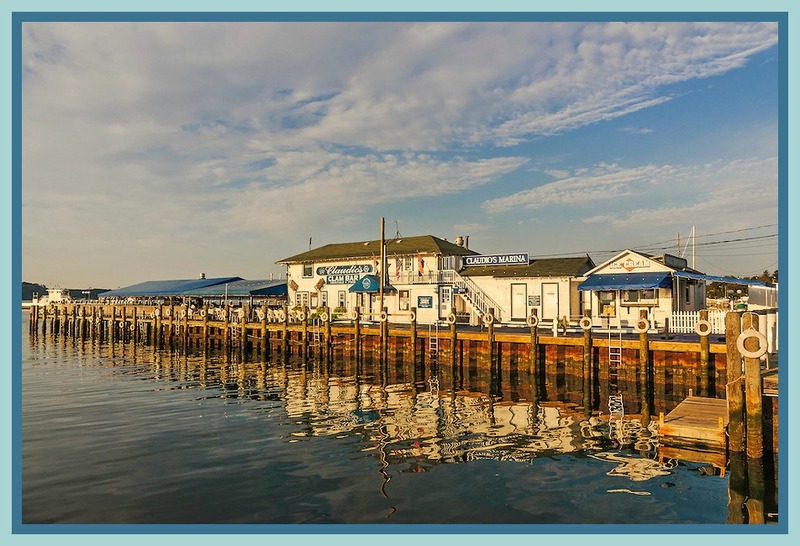 You have the option of going straight to the docks and waiting for the fisherman to come in; and see what is available to purchase from the days catch. If you change your mind about fishing yourself, you could join the fisherman and set sail. Each boat has a schedule posted and they go out daily. It is a four hour fishing trip for around $40 and the rod, reel, bait and tackle are included. Nice day trip for the kids. This is a picture of the Captree State Park Fishing Fleet. 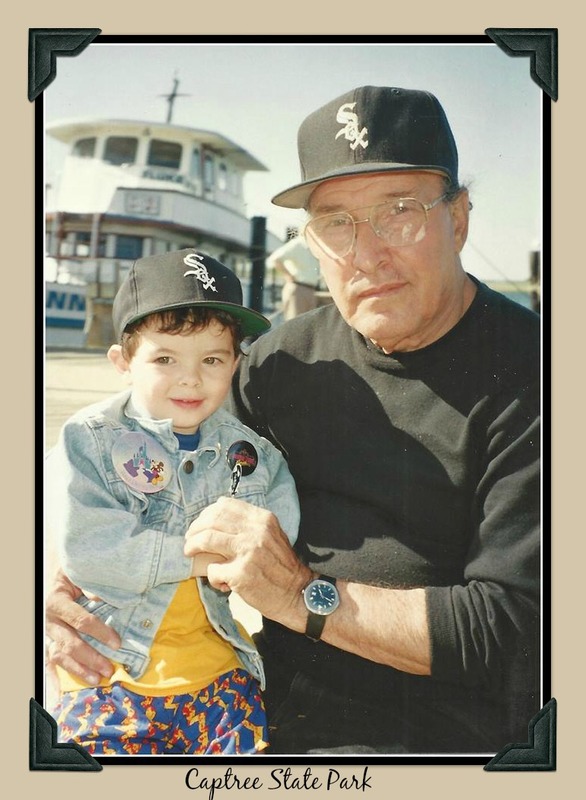 My dad would take Michael to Captree for lunch and time at the playground and wait for the fishing boats to come in. Captree is a small NY State Park with a beach, fishing pier, playground, bait shop and restaurants. 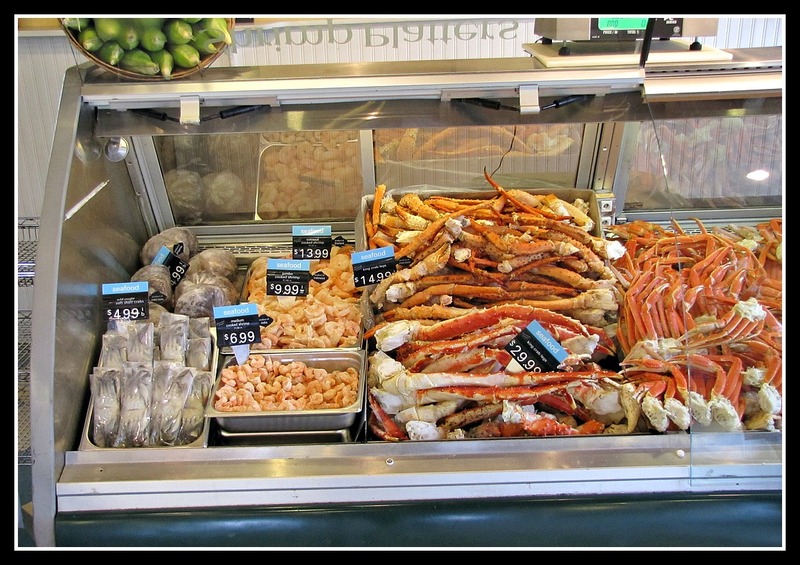 If you don’t have the time to wait at the dock or set sail, then head on over to a seafood market. 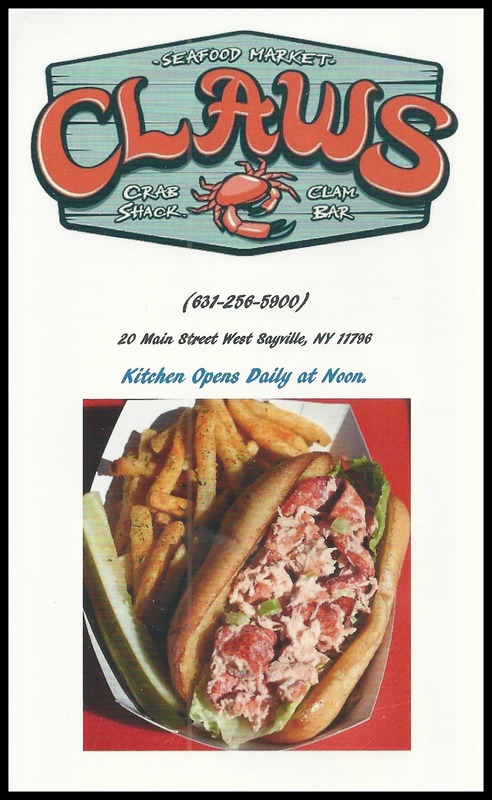 We have a lot to choose from on Long Island, and many have a restaurant or clam bar attached so you can eat there or take home a meal. 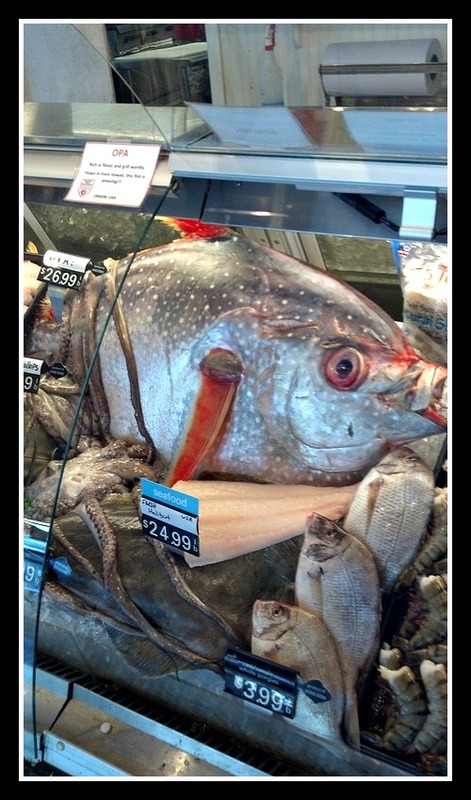 Here is just an example of one of the seafood markets that I shop in. The variety is endless. 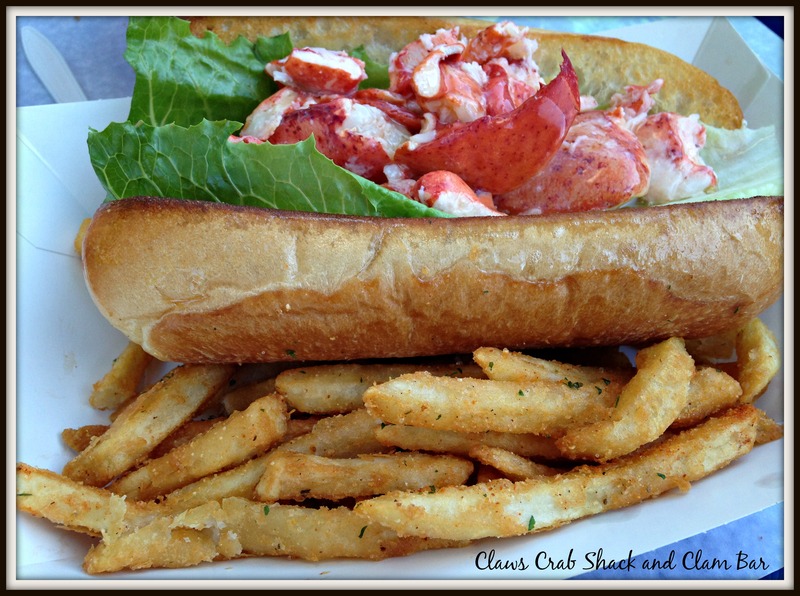 According to my husband, they have the best lobster roll. 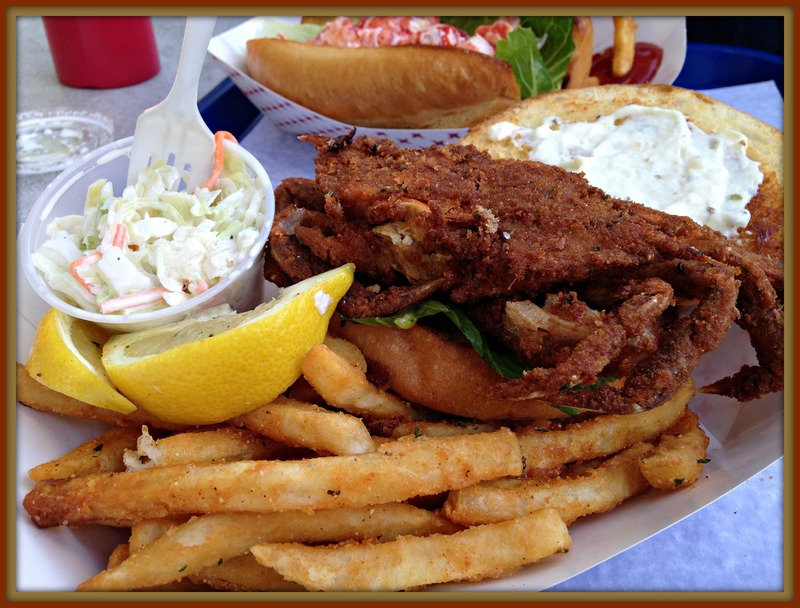 and I am happy with the soft shell crab sandwich. 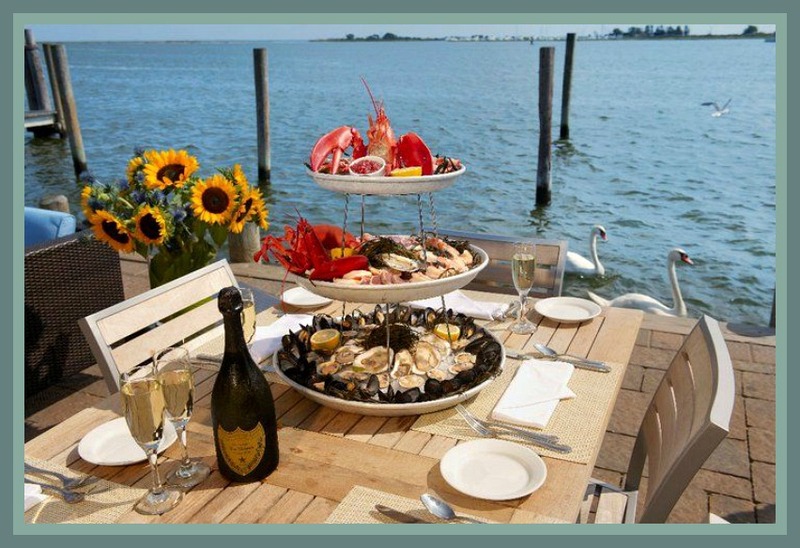 If you’d rather not cook at home or want more than take out, there are numerous restaurants serving Long Island seafood; some with gorgeous waterfront views. 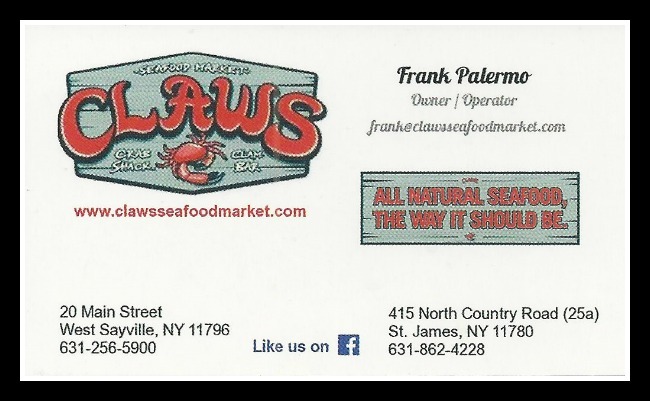 Well, we have to have clams at a clambake and clams are a big part of the seafood of Long Island, either raw, baked or steamed. 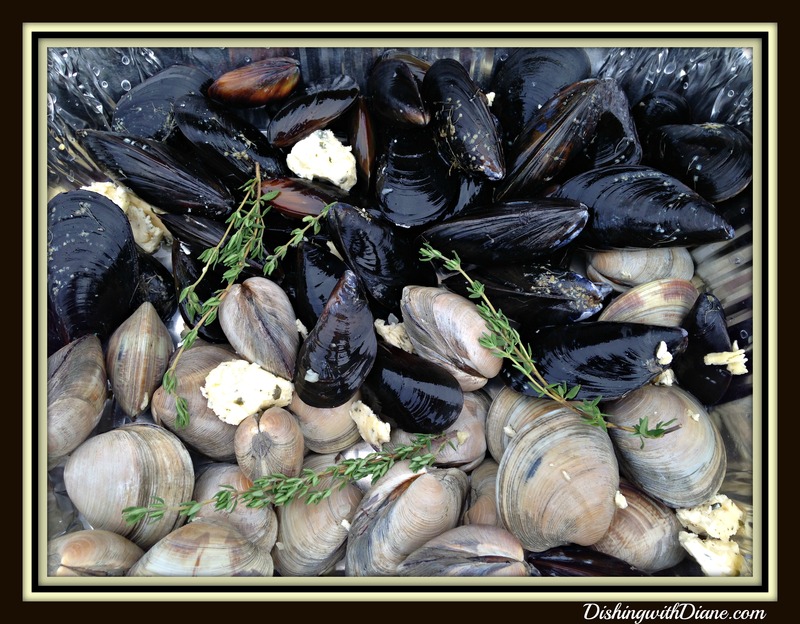 I prefer to steam clams on the grill with some white wine (some use beer), butter, shallots, garlic and parsley or thyme. When I was a child, I would go clamming with my family and eat clams raw, straight from the ocean. My dad would shuck the clams and serve them minutes after we got them. You can’t get any fresher than that. 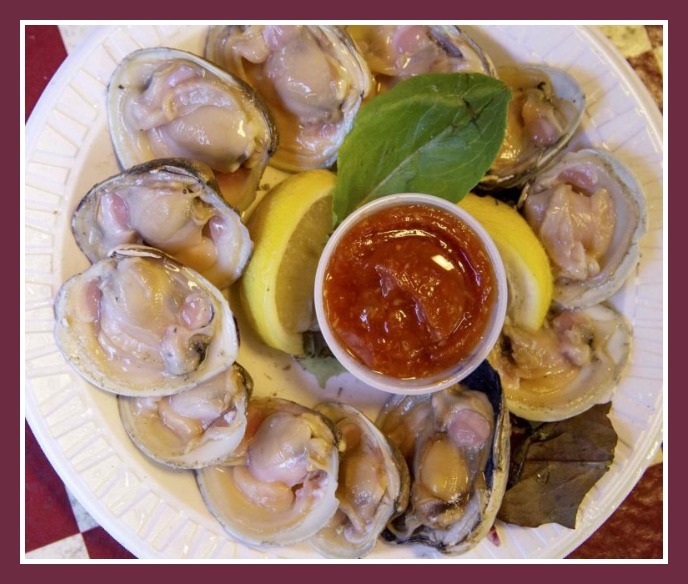 Today, raw bars with both clams and oysters are very popular in the local restaurants. Raw clams are usually very sweet on their own, but you can also eat them with a little lemon and hot sauce. Along with the clams I like to steam mussels the same way; and then grill some marinated shrimp and spicy chorizo sausage for my clambake. I’ll add the clams, mussels, shrimp and chorizo all together on the paella pan and then add some finishing touches. There are so many farms on Long Island, that a stop at a farm stand is all you need to find the additions to complete the clambake. I usually buy local corn and baby red potatoes. Another claim to fame for Long Island are the Peconic Bay scallops; harvested by the most devoted baymen who just love what they do for a living. I love scallops; so they will be on today’s menu as well. 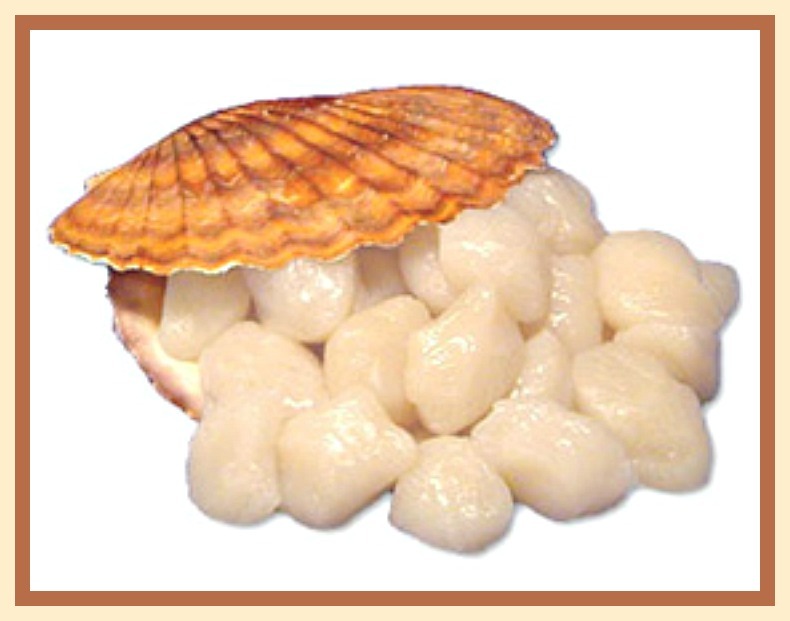 (Bay scallops are small and sea scallops are larger). 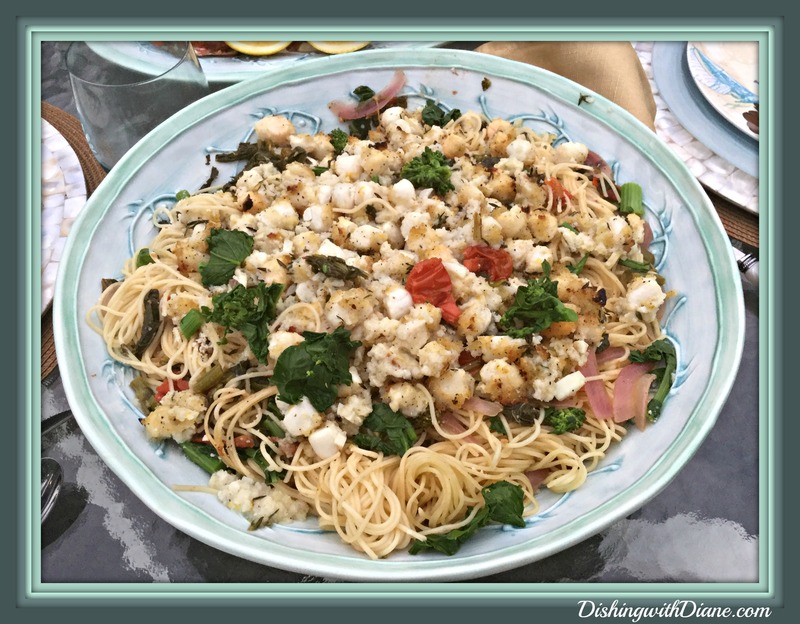 I don’t prepare the scallops on the grill; instead I marinate them, broil them and add them to either linguine or capellini with a summer sauce of fresh tomatoes, white wine, basil, garlic and broccoli rabe. We have a Chef here on Long Island, Chef John Ross, who has earned his place in history as the Chef of North Fork cuisine. He was farm to table before it was popular and the scallop recipe is all his. I found this recipe in one of the many publications he wrote for over his 40 year career. Now the crabs…every kid on Long Island has gone crabbing at least once during summer vacation. I used to go with my dad and spend hours at the docks. Throwing traps in the water with a chicken leg or two inside as bait and waiting patiently for a crab to come along. I still have my dad’s crab traps. It is a lovely cherished memory I have of him. My dad was a master at cleaning a crab and my mother would make a delicious tomato based crab sauce with his catch and we would eat the crabs with linguine – for hours. 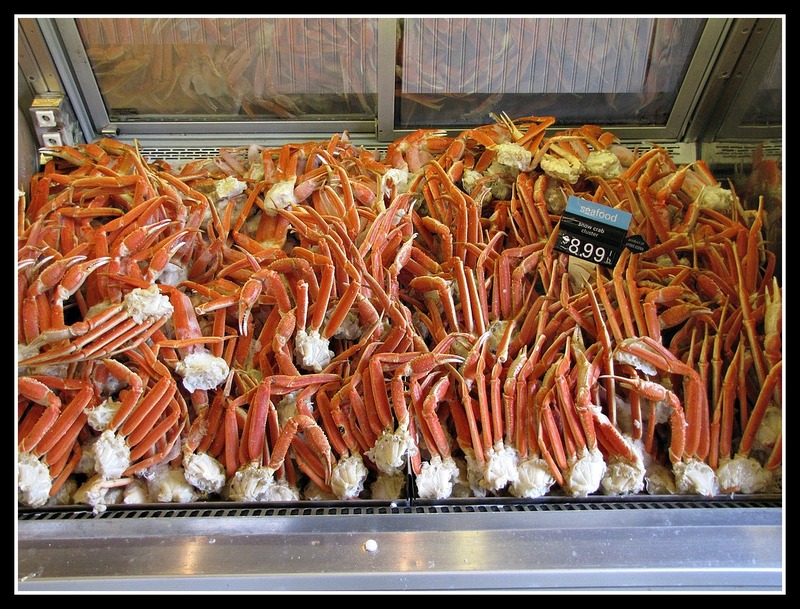 I am not making a crab sauce today because I have the sauce for the scallops with capellini; so today I am baking the crabs with garlic, breadcrumbs, parsley, cheese, lemon and white wine. The same type of stuffing you would use for a baked clam. Just to let you know, you have to have a lot of patience not only to catch a crab, but to eat a crab. Breaking the shell with the mallet or seafood crackers and digging out the meat with a small seafood pick is time consuming. But if you are with a group of family and friends, having a great conversation and a glass of wine, the time goes by so quickly and every bite is delicious. Now some beverages to go along with the clambake. Long Island has numerous vineyards and wineries on the north shore so we have to include local wine with dinner. 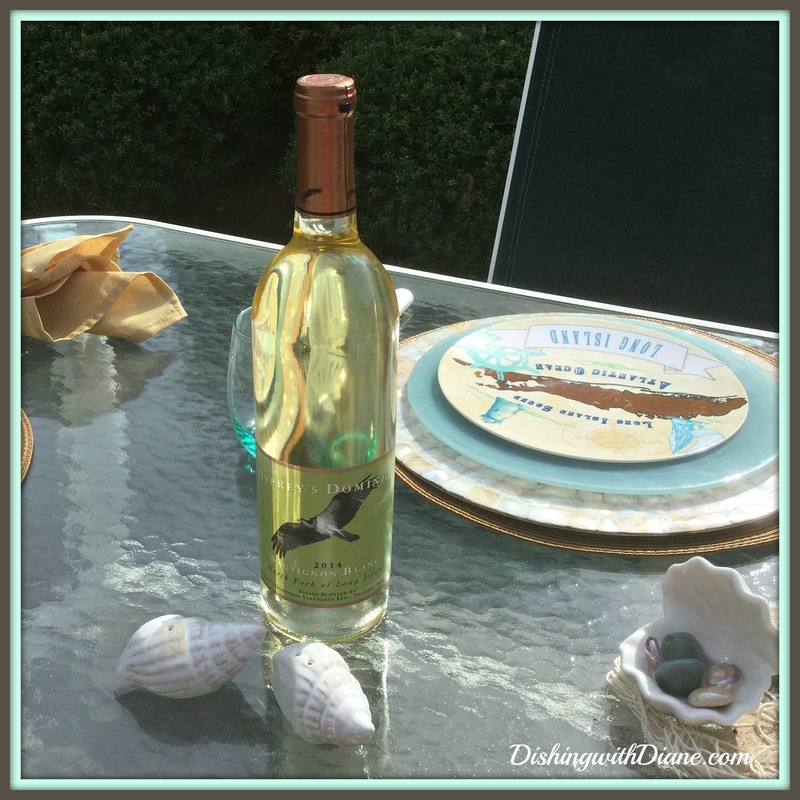 One we enjoy with seafood is a Sauvignon Blanc from the Osprey Dominion Vineyards bottled in Peconic, Long Island. 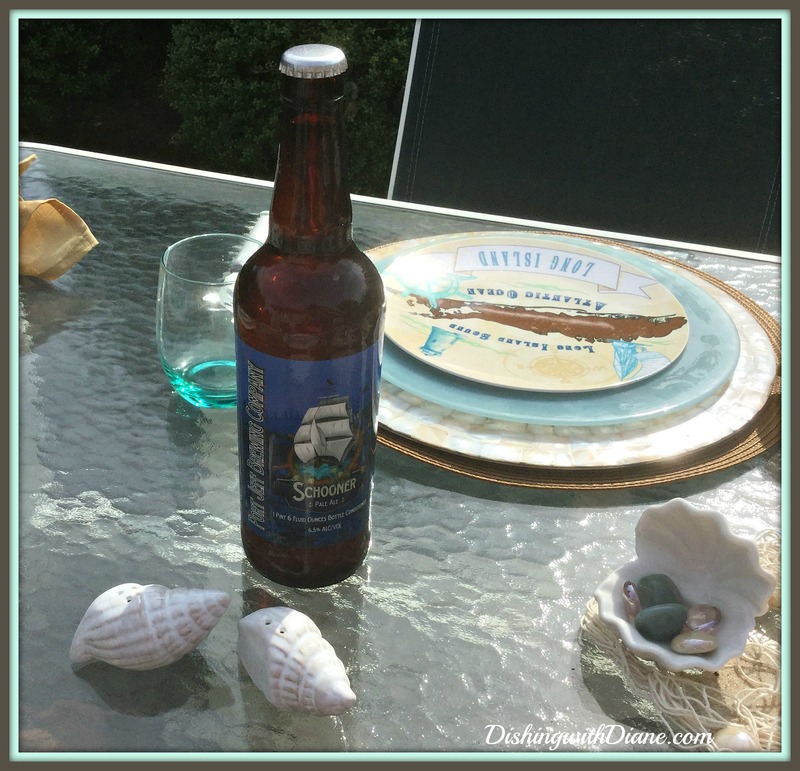 Long Island craft beer is growing in popularity and Bob likes to sample different varieties when we go out to eat but one of his favorites is the Port Jeff Brewing Company’s Schooner Pale Ale bottled in Port Jefferson, Long Island. If you can find both the wine and beer where you live, give them a try. 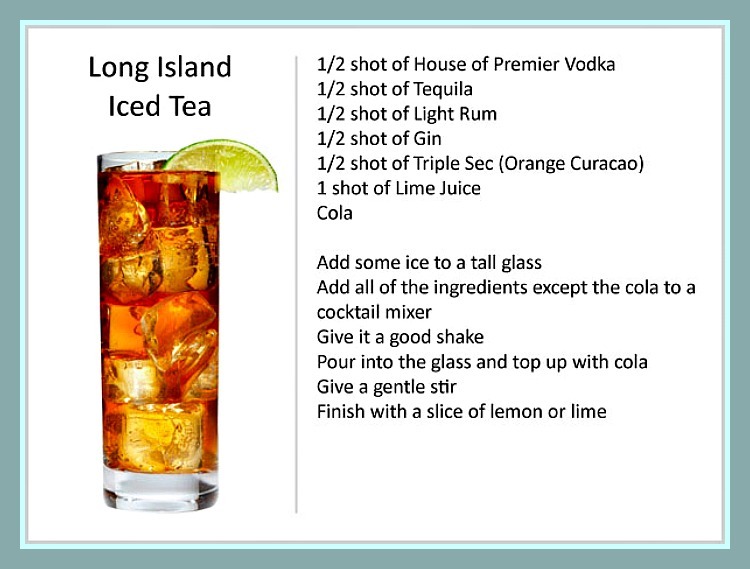 And of course, everyone has heard of the Long Island Iced Tea. This isn’t something that Bob and I drink but I decided to post the recipe because it has become so iconic to Long Island. After dinner there is always room for dessert. We always serve sliced watermelon, fruit, toasted marshmallows and a farm stand pie. 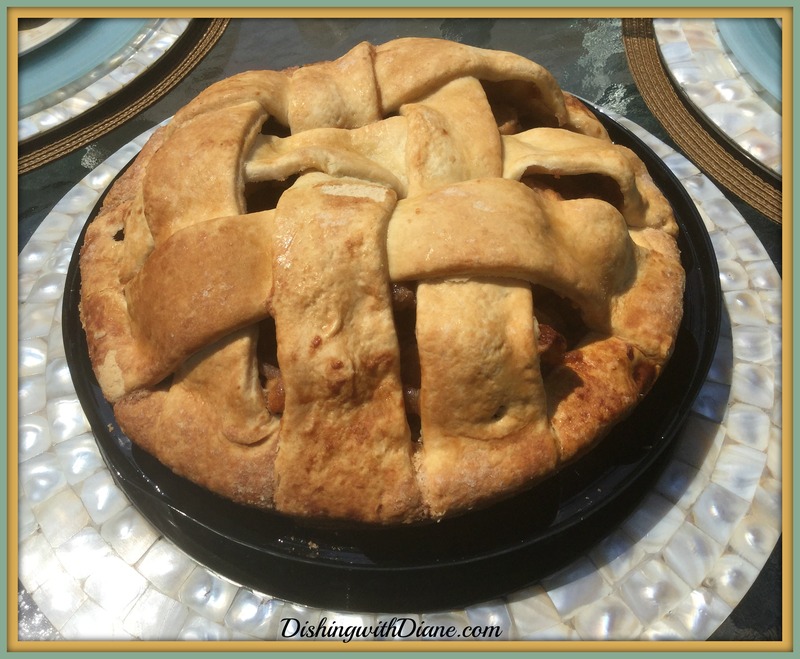 Today I am serving good old apple pie. Last year, Bob and I went to a launch party for one of Long Island’s food magazines and we discovered something new to add to the dessert list for our guests. 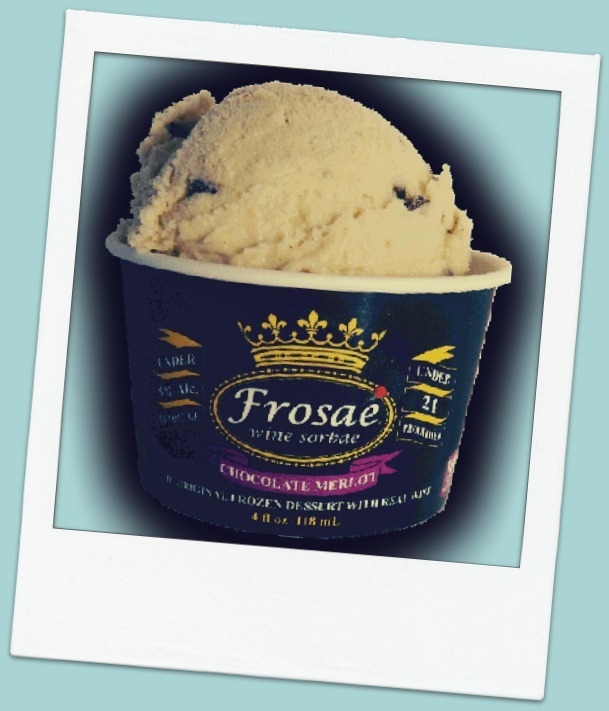 Wine sorbet – yes, that’s right, sorbet made with wine from the vineyards on the North Fork of Long Island – delicious. My favorite is the chocolate Merlot. And that completes my summer time meal. 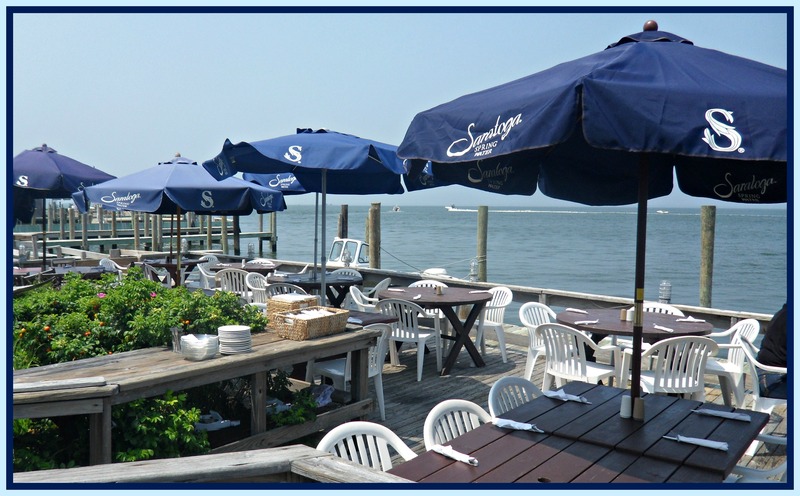 Place 1 ½ pounds of Peconic Bay scallops in a bowl. Add the marinade ingredients to the bowl and toss the scallops. Let the scallops sit in this marinade while you prepare the sauce and linguine. Heat a large sauté pan and add 2 tbsp. olive oil. Add 1 chopped red onion and a tbsp. of minced garlic and cook at medium heat for 5 minutes. Quarter 1 pint of cherry tomatoes and add them to the pan. Continue cooking for another 5 minutes before adding ½ cup white wine. Let this reduce and the sauce thicken, then add ½ cup chopped fresh basil and remove from the heat. Trim the ends off of 1 head of broccoli rabe, rinse and chop coarsely. Bring 3 quarts of water to a boil in a large pot and add 1 pound of linguine. Cook until almost tender and add the chopped broccoli rabe to the pasta. Let it come back to a boil and drain. Combine the sauce and the pasta/broccoli mixture and keep warm. Line a sheet pan with foil and spray with a no-stick spray. Spread out the marinated scallops on the sheet pan and place under the broiler for about 10 minutes or until just cooked and browning on the top. Serve the scallops on top of the pasta and add grated cheese. * cooks note – I usually use 2 pints of cherry tomatoes along with a ladle of pasta water because I like more sauce with my pasta. Until my next post, make every day a celebration ! 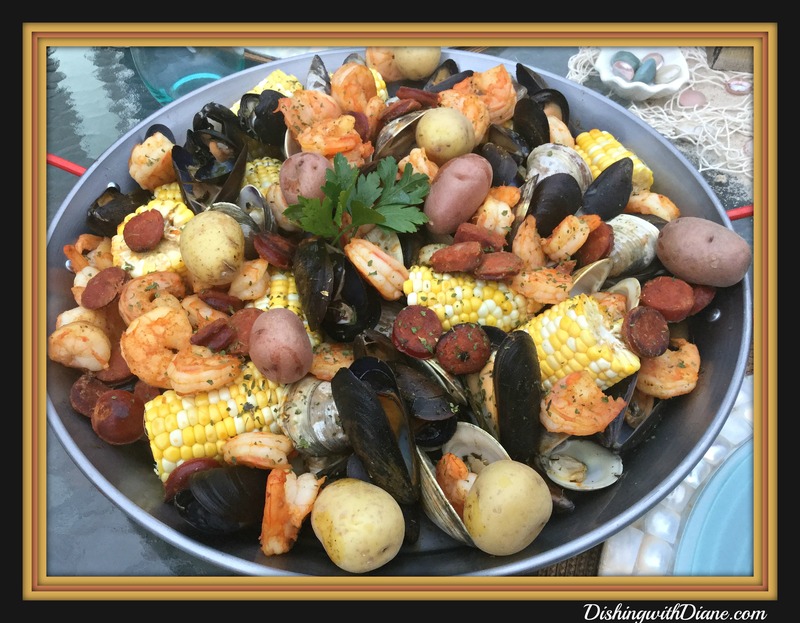 This entry was posted in All Occasion Tablescapes and tagged Welcome Summer, with recipe on July 10, 2016 by aries041158. Oh my God. Michael and your father. 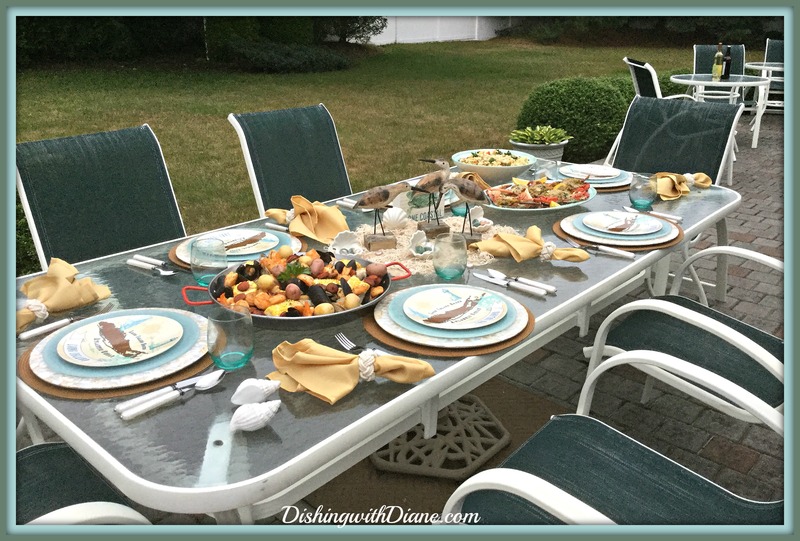 I love those photos, and I love your outdoor summer tablescape. Thank you- remember when Michael was a peanut? He loved his grandpa. Beautiful Diane as always. everything looks delicious! Great post! Your information was excellent especially if any readers did not grow up on LI. I have been planning to have a small dinner party now I think LI will be my theme. My father in law used to go to the the Jones Beach jetty almost everyday after work to fish. He always had the fresh “catch of the day” at his house . Good memories. Thank you Nancy. I am so glad you liked the post and it gave you some inspiration for your dinner party. Growing up on Long Island was a real treat. Let me know how the dinner party goes and post some pictures.The wine sorbet will be a nice surprise. 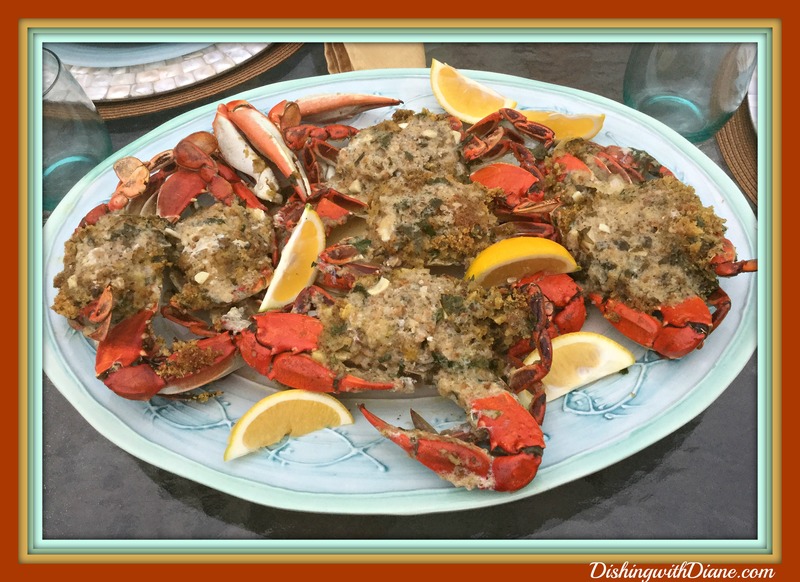 lovely post diane — I feel like I took a mini -vaca w ,yummy seafoods included !! !